The Bible says that the greatest love is the one who gives his life for his friends (John 15:13). Jesus calls us his friends and loves us, even with all our faults. 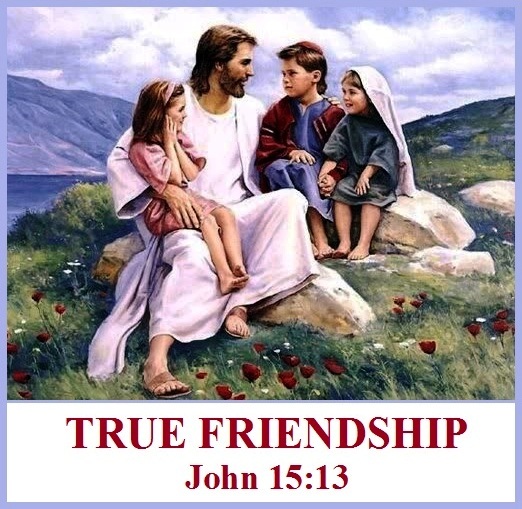 Jesus is the perfect example of friendship revealed in the Bible, because He gave His life to reconcile with God all those who believe in His sacrifice. He died in our place because He is a true friend. Because of Jesus’ sacrifice, we can be friends with God. Sin no longer separates the one who is saved, from friendship with God. This means we can have a relationship of true intimacy, unity and love with our Creator. Therefore, true friendship is based on the love of Christ and Jesus is our great example of the most valuable friendship of all. Friends are people who have things in common like studying the Bible, and who enjoy each other’s company. We can have many acquaintances with whom we get along well, but a true friend is a person who sticks closer than a brother (Proverbs 18:24). A Christian friend should respect our decisions even if they do not agree with them; knowing that whatever decisions we make, we are the ones that ultimately will be responsible for them: “For we (all believers) must appear before the judgment seat of Christ, so that each one may be recompensed for his deeds in the body, according to what he has done, whether good or bad” (2 Corinthians 5:10). Jesus is not only our best Friend but also our one and only Judge. One of the most known cases of genuine friendship in the Bible is between David and Jonathan, as you can see in 1 Samuel 20 and 2 Samuel 9. Their friendship was so strong that Jonathan risked the wrath of the father to save the life of David, and David looked after the son of Jonathan, Mephibosheth when Jonathan died. The Bible tells us that the hypocrite with his mouth destroys his neighbor, but through knowledge the righteous will be delivered (Proverbs 11:9). We need to be aware that the mouth can be used either as a weapon or a tool. We either hurt our friends or build them up. Sadly it is often easier to destroy than to build, and most people have received more destructive comments than those that encourage them. Our words make a difference; are they a weapon for destruction or tools for construction? What kind of friend do you want to be? And how many people you call friends would you be willing to give your life for?